A conference (“Games of Empires”), organized by the Department of Ancient History and the Departement of Transcultural Anglophone Studies’s, at Saarland University is scheduled for April 2016. The lectures are to be published in one of the following issues. It is planned to hold follow-up meetings annually or bi-annually with changing venues. 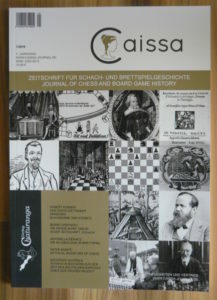 → Rezension auf www.chessbooks.nl von John Elburg (“Certainly one of the most interesting chess magazines that I have ever seen!”). → Rezension (pdf, niederländisch) in der Rubrik „Schaken“ im Nederlands Dagblad von B. H. Wilders. →Rezension (norwegisch – Übersetzung: pdf) auf der Homepage des “Fredriksstad Schakelskap” von Holger Blauhut.